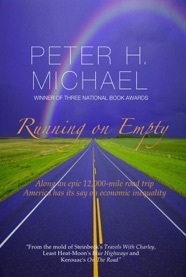 Running on Empty was awarded the 2015 eLit Gold Medal for Current Political and Economic Events and the 2015 eLit Bronze Medal in Travel Essays. In his vivid descriptive style, prize-winning author Peter H. Michael recounts his classic 12,000-mile road trip taking in the expansive variety of people and places of the United States. Michael set out not to fathom the country "in search of America" as Steinbeck, Kerouac and Least Heat-Moon had but to listen and let America tell him whatever it might. Tell it did. Ranch hands, cave guides, linemen, nurses, executives, teachers, trailer park pensioners, a decathlete, couples with upside-down mortgages, the poorest county, the wealthiest county, whites, blacks, Indians, Hispanics and Asians all sing verses of the same song: America's widening economic disparity. Michael listens to Americans finally awakening to the income and wealth gaps which over the past generation have eroded the middle class and hit the poor hardest of all. Using his economics and demography expertise in clear punchy style, he demolishes plutocrat arguments in an eminently readable exposé on economic inequality and how the ultra-rich and corporations purchase it through the protection money called campaign contributions. Along the long American road, those met gently speak their minds as the author and his wife are feted by a banquet of uniquely American vignettes, personal stories, yesteryear small towns and local history while the continent's majestic geography unfolds each day—a mysterious desert amidst Great Plains grasslands, the middle of Lake Michigan, Yellowstone splendor, hushed redwood groves, languid riverside campsites, red rock Great Basin vistas, the High Sierra, desert ghost towns, an inland delta, the longest cave, Lincoln's chair, Faulkner's study, Morgan Freeman's juke joint and much more. Running on Empty was released in March, 2015.